My knitting goal this year is to knit 52 Hats for Sailors. Since it only takes about one afternoon and one evening to knit a hat, I should be able to reach my goal! Here are the two most recent hats. #21 is a color test for a wishlist cardigan. The cardigan is the Marysville Cardigan from the book Modern Country Knits: 30 Designs from Juniper Moon Farm. I love these colors, and the two-color design is really easy to knit. I just saw a new book, Cats in Hats, today. It looks like Samosa want a hat for himself! 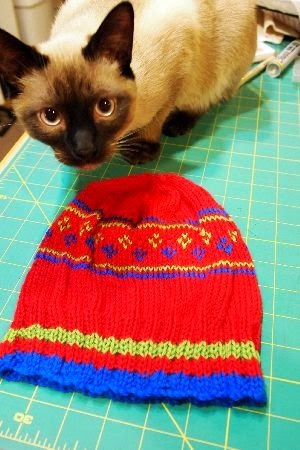 Wendy Knits has a review of the book on her blog where you can see some more cute kitty headgear. 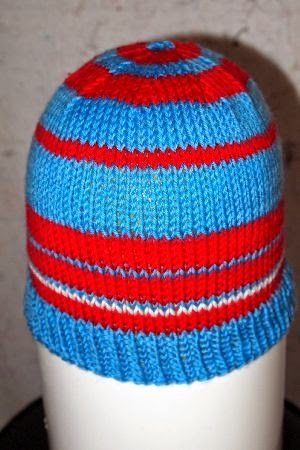 The second hat was knit for Pi day, March 14. If you're a math geek, you'll notice the number of knitted rows represent the digits of Pi: 3.1415926535. The white row is the decimal point. I ran out of stitches before I could complete the 11th decimal place. Details are on my Ravelry project page, where my user name is AuntMarti. You are such a busy beaver, do you ever sleep?! testing to see if I can post comments again!